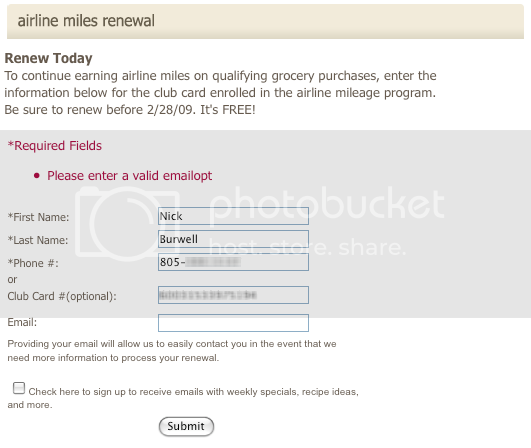 I got an email from Vons (aka Safeway) a few days ago, saying that I needed to go to a webpage in order to renew my mileage points option with them (did you know you can get United miles just by using your Vons card?). First, I was disappointed that I had to re-register. I had signed up on my United mileage account page for this service a year or two ago, and it was working. Why did I now have to go to Vons.com and fill out a form? But I didn't want to lose earning miles, so I dutifully filled it out. Clearly they had some server side validation of the checkbox (and didn't even bother to transform the error into a friendly message), and I'm guessing it was incorrectly wired up such that if the optout setting was not provided at all, it would cause a validation error. Well, when you have a checkbox on a form that does NOT get checked, that field does not even get sent across to the server (I know, it would make more sense to send that field, with a value of 'false', but it wasn't my decision. Also, Rails encapsulates that nicely with a hidden input field, but I digress). At any rate, all web developers should know that by now and have tested it. So now my only choice was to give an email address and check the box. I was trapped because I wanted to give my valid email address in case they had problems w/ my renewal (because I did not remember the phone number on my account...), and yet didn't want to get the weekly emails. Against my best judgment I gave them my email and my "consent" to blast me with whatever emails they wanted. When you make a nice comment about your wife (who's not in the room), social etiquette says you should expect the response from others to be something like: - "Awwww, that's so sweet!